Program was dedicated to ‘The Death of Stalin’ movie but soon turned into a boxing match. 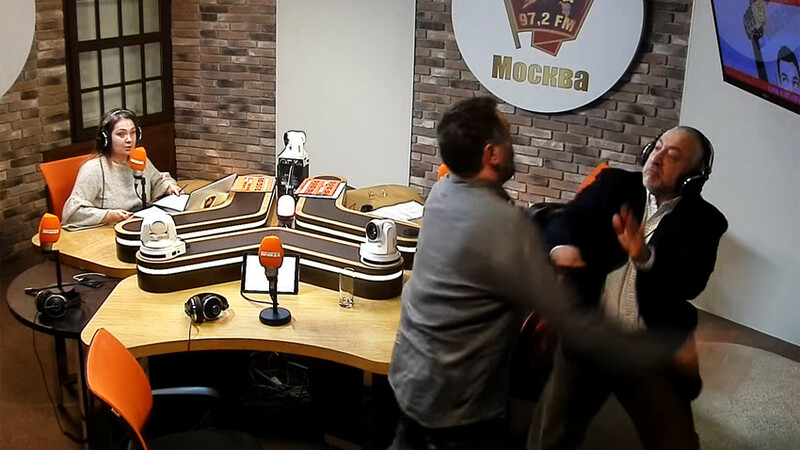 Nikolai Svanidze, a historian and TV and radio host, and pro-Kremlin journalist Maxim Shevchenko, chief editor of the Kavpolit website, came to blows during a heated debate about the role of Joseph Stalin during WWII. “Go ahead, I’m right here. Get up and hit me, you coward,” Shevchenko retorted. “Do you really want it, chicken?” said Svanidze before slapping his face, prompting Shevchenko to punch his attacker and pummel him on the floor.